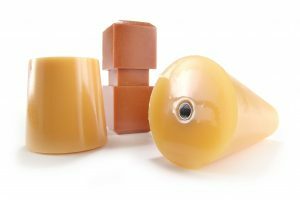 Urethane Bushings – Impact Resistant Bushings! Urethane Bushings ? You’ve come to the right source! 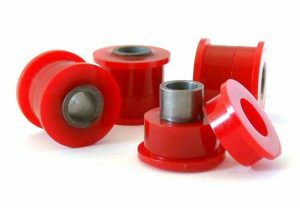 Custom Urethane Suspension Bushings: Custom urethane suspension bushings are not only found in most of the cars we drive today but in most heavy equipment as well due to the ability for urethane to outlast rubber 3:1. 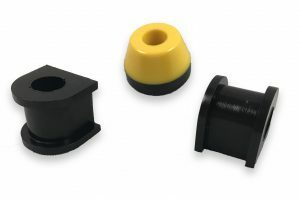 Urethane Control Arm Bushings: Urethane control arm bushings also know as “A-arm bushings” are installed in the steel rod that connects the hub to the vehicle. Made from a superior high-quality urethane prepolymer the urethane control arm bushings will last for many years. Polyurethane Suspension Bushings: Suspension bushings have been used in the automobile industries as well as industrial applications. Polyurethane is an ideal choice over rubber as polyurethane will outperform rubber on an average of 3 to 1. Polyurethane Motor Mount Bushings: Polyurethane motor mount bushings are found in many applications requiring vibration protection to reduce impact and abuse to the machine and operator. Polyurethane motor mount bushings will dampen the harsh slamming of a machine and hold up often times better than OEM replacements at a fraction of the cost. Polyurethane Spherical Bushings: Some common advantages of spherical bushings are that they provide outstanding chemical resistance and are also non-marking with a noticeable noise reduction vs other similar materials. Polyurethane spherical bushings have great abrasion resistance and excellent load-bearing performance. We offer a variety of color pigment options. Custom cast bushings are used in industrial equipment applications because of polyurethane’s superior properties over rubber products. They also can be molded into custom designs to suit your industrial or automotive bushing application requirements. Since plastic and rubber are biodegradable they are more susceptible to deterioration over time. Polyurethane is stronger and can last for the lifetime of your application. Our engineering department can turn your idea, sketch, drawing or CAD file into custom urethane parts. We will reverse engineer to recreate any urethane bushings for production or one-off urethane pieces. For over 30 years we have focused on using Speed and Precision to rapidly deliver the highest quality industrial cast poly bushings and parts to our customers. The engineering department uses SolidWorks and our machine shop uses CamWorks for 3 axis milling. Our equipment includes CNC mills, lathes, polyurethane grinders as well as a state of the art urethane waterjet cutting machine. Secondary equipment includes sheet metal, welding, grinding, automated cutoff, broaching and more. We offer complete manufacturing capability for the inserts or cores required for your parts and provide one-stop shopping for all of your custom cast rubber bushings. We routinely perform tests according to an established set of standards provided by an accredited testing organization such as the Society for Testing and Materials (ASTM) who define the procedures in detail. Polyurethanes are outstandingly able to withstand more loads than rubber because they are harder than rubber and yet more flexible than plastics. Their flexibility is accountable for their strength and remarkable ability to resist impact. Plan Tech’s custom bushings are the perfect choice for applications against severe wear regardless of low temperature. For some decades now, they have been the most used materials for environments that are highly abrasive owing to their super ability to resist abrasion. No other form of elastomers, metals, and plastics has a better abrasion resistance than polyurethanes. Their abrasion resistance ability is rated to be 10 times better than what other materials can provide. Productions such as prototypes as well as one time products or one-off bushings are often manufactured using polyurethanes. Resilience is generally a product of hardness. Rubber bushings are the perfect choice for elastomer applications that can absorb shock. They have a high vibration frequency or outstanding ability for quick recovery. Their remarkable resilience ensures polyurethanes are very tough materials. Are you interested in cast Urethane Bushings? Please Contact us so we can help solve your requirements and work with you on your specific application!